Saumur, Loire, FranceLoire Valley cabernet franc is an adventure in acidity and aromatics, but when it is ripe it can be sublime. This wine, made by a respected co-op, excels in 2105 with a fresh, peppery, black fruit nose. The palate is more of the same with that aforementioned acidity prominent beneath the earthy, spicy, savoury black fruit with a touch of tannin yet to disperse. Grill with your favourite meat for the perfect match or lay it down for three to five years for even better results. Good value. 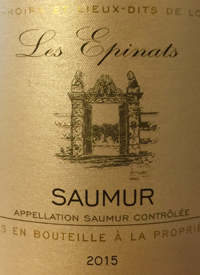 The wine-growing region of Saumur, located on the south bank of the Loire, comprises 2700 hectares of vineyards spread over 37 communes.Tasted: 21 March 2017Tasted by: Anthony GismondiPrices: BC	19.99	BCLS Producer: Alliance LoireDistributors: Waldorf Wine Group Inc.